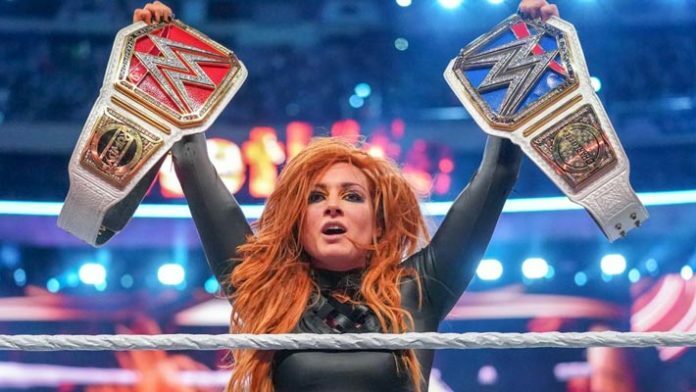 Becky Lynch is riding high after capturing the Raw and SmackDown Women’s Championships at WrestleMania. The Irish grappler has reached the top of the mountain, but is a marked woman with foes from both brands looking to dethrone her. Lynch recently spoke with Middle East publication The National about her big night at WrestleMania and what she sees awaiting her in the months ahead. Based on what we saw on WWE television post-WrestleMania, it appears Lynch’s first feud will be against main roster newcomer Lacey Evans. Lynch gloated about toppling Ronda Rousey at WrestleMania, joking that she ran Rousey straight out of WWE. She also took a dig at Rousey suffering a badly broken hand at WrestleMania. When asked how she feels about “Ronnie” the “little weirdo,” Lynch didn’t hold back. Becky Lynch has dubbed herself “The Man,” a moniker that has been embraced by men, women and children alike. Although “The Man” is inherently a masculine descriptor, Lynch explains that it is not about gender, but instead about being the best you can be. Visit TheNational.ae to read the full interview.